One of my goals for the new year has been to grow spiritually. Over the past several weeks, I have had the opportunity to read and review 30 Days to Understanding the Bible by Max Anders. What did I think of 30 Days to Understanding the Bible? 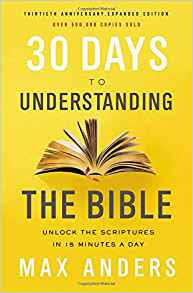 30 Days to Understanding the Bible has an easy to use format. The author breaks down the major passages of the Old and New Testaments into small, easy to understand chapters for readers. While this book doesn't cover every passage--it covers enough to allow for an understanding of the people, places and events encountered. Information is presented in a workbook like manner that allows readers to review the details learned again and again for understanding. 30 Days to Understanding the Bible makes an excellent reference tool. I read the chapters of the book along with the relevant passages of the Bible. The information truly did help my understanding--and it did help me form a stronger basis for further reading. Would I recommend 30 Days to Understanding the Bible by Max Anders? I think this book is very well written, well organized and effective for readers who are somewhat new to reading the Bible. This book is more textbook / workbook oriented--and doesn't offer a lot of commentary nor author interpretations. The chapters are the perfect length for a daily Bible lesson--and the text is easy to use and understand. I would highly recommend it for anyone seeking a better understanding of the Bible's persons, places and events. Dr. Max Anders is the author of over 25 books and is the creator and general editor of the 32-volume Holman Bible Commentary series. He has taught on the college and seminary level and is a veteran pastor. Max was also one of the original team members with Walk Thru the Bible Ministries. He provides resources and discipleship strategies at MaxAnders.com to help people grow spiritually.